Holiday Party - December 13th - do we want one? Financial Report – There is 3161.46 in the bank as of September 30, 2017. We received $267.71 in donations and were reimbursed from the RTP grant for $315.32. John Robinson reported that the tree tags have been screwed on to the trees. Charles Castronova reported we have use of a shed. Jane said she would supplu boards to fill the holes in the side of the shed. Dianne Press said that the interpretive signs are in production and should be in the park in about two weeks. Jane Daniels, Pam Lupfer, Anwer Quieshi, Maria Adams, and John Robinson were at the Yorktown Street Fair. There were many questions on how to reach the new trails. Dianne Press and Charlie Castranova had similar questions at the Support Connection about how to find the new trails. Jane reported that Rebekah Casino who is doing the Other Side of FDR had contacted Bill Newman of the Disc Golfers for photos and video. Charlie said she has contacted him about dog walkinng. Discussion: The review of plans for 2017 showed that many things have been accomplished this year and . 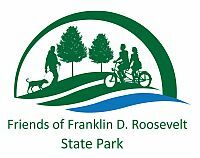 Plans for next year include developing signs to encourage people to explore the other side of FDR and to acknowledge what the Friends have done for the park.